my buddy Ace and me"
After a season of Quail hunting with the owners of Remchester Brittanys and watching their dogs work, I knew I had to have one. My wife and I picked up our puppy, Avery, when she was 8 weeks old. From day one her innate instincts have been amazing- quartering, fetching, pointing, and a diehard love for birds. Being that Avery is my first bird dog I can honestly say that I have made every rookie handler mistake in the book. Fortunately, Avery is a very resilient dog and we have worked through my mistakes. Aside from being a great field dog, Avery, like all Brittanys, make fantastic companions. 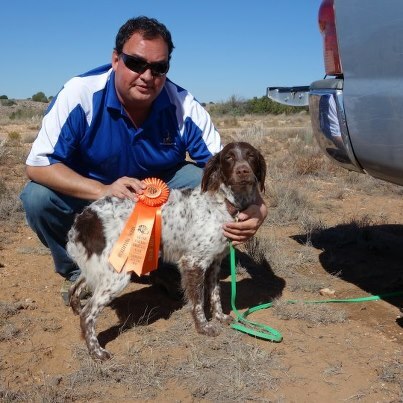 There are many choices of dogs when looking for a bird dog, but honestly you will find no better than Remchester Brittanys. The dogs are bred with love and a true passion for their sport. The owners, Don & Wendy, are very active in numerous bird dog clubs and their reputation for producing the best Brittanys precedes them wherever they go. If you are considering a puppy and would like me to persuade you into a Remchester Brittany, feel free to call 623-670-0281. Thanks for a dog that surpassed all of my wildest dreams. Stitch hunts all day and sleeps all night. What more could you ask for? He was a natural retreiver and took to the water like a fish. My trainer finished him and asked if he was for sale. I wish I had a picture but I sure will send one when I can. We named him Maverick and he is doing great. I can not thank you enough for your guidance through this process. We have never had a puppy shipped to us and you made it so easy. Maverick arrived safe with all the things you provided. We really appreciate all you did. Jim has already had him out many times and he always comes home amazed. Please keep us in mind when you have another litter and thanks again. We looked at a lot of pups before we saw your web site. It invited us to compare and we did. Your dogs sell themselves. You truely love your breed and it shows. Most breeders we found lacked a certain ethics, that was not the case with you guys. Bella has been healthy and a real joy in our lives. You have been there every step of the way and that says a lot about Remchester Brittanys. Lisa never wanted 2 dogs but you have us looking with your new litter. I wanted to ask you if I could list you as a sponsor to join AZPDC. Anyhow Kimber has been to training class with Don Humes 4 times and she´s progressing nicely. First bird flew about 30 yards and she chased it down and retrieved it right to me! She´s already progressed to the point where she´s using her nose, we´re shooting over her and she hunts independently! She´s going to make a good hunting dog and perhaps even trials dog. I hope to have her in the hunt tests in October and hopefully I can get her Junior Hunter Title by the end of the year. BTW you have a solid reputation for putting out some great dogs! Anyhow, let me know if I can list you as a sponsor. Growing up I always wanted my own bird dog and when it finally came time to buy my own I wanted to do it the right way. I wanted a quality dog with excellent instinct and looks to match. I searched for nearly two years before coming across Remchester Brittanys. After exchanging a few emails and a phone conversation I was impressed with Don and his knowledge and willingness to answer any questions I had. Once I was on the waiting list Don kept me informed and updated during the entire process with emails, pictures and facebook updates, making the experience something special which is what I wanted. 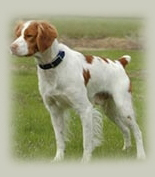 Howser the Brittany I purchased from Remchester Brittanys exceeded all of my expectations. At exactly a year old he was pointing pheasants and impressing everyone I hunted around. I would definitely recommend going through Remchester Brittanys if you want a lovable house dog and ultimate hunting companion. My journey to Remchester Brittanys began over three years ago. 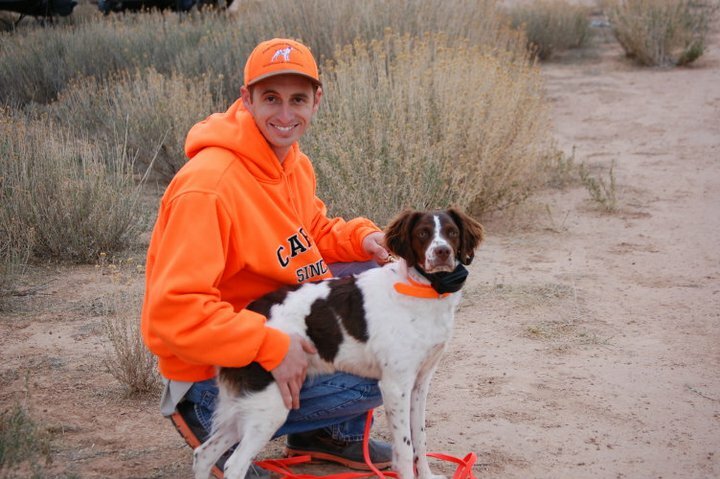 I had researched breeds and capabilities at some length and decided on the Brittany Spaniel as the hunting dog most compatible with my wants and tempermental disposition. I contacted several breeders in Colorado, Kansas and Arizona and went through their individua...l web sites in depth numerous times. I called five of the breeders and talked to them on the phone. Deciding on Remchester was a "no brainer" after those calls. I started talking often with Don and Wendy. Finally the spring of 2012 Don indicated they were going to have two litters that year so I flew from Alaska to Phoenix and went to their home to interview the prospective mothers - or was it be interviewed by them. I was never quite sure which it was. Of course Don and Wendy interviewed me throughout our contacts and my visit to make certain I was worthy of being granted the honor of owning one of their pups. Thank God I passed that test! While at their home both future mothers were very people oriented and either would have produced a great puppy. But then it happened - Shade came over and laid her head on my lap - end of selection process for me! Don did tell me that because of the credentials of the sire the pups from this litter would be somewhat higher in cost than the other litter. My only question was whether he wanted the money immediately or he could just tell me how much he wanted and when. 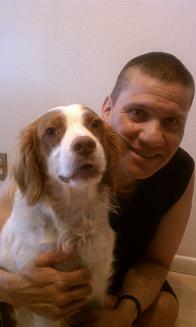 Knowing that I would actually end up getting my Molly (Remchesters Alaska Gold Rush) later in 2012 or early 2013 I went back to Alaska and eliminated my own job so I could come to the Valley of the Sun and buy a house for Molly and I. The litter was born December 19, 2012. I had the distinct honor of being allowed the first choice of the females in the litter. My Molly was the smallest of the litter with the smallest feet and I wanted a smaller dog so she was it. Besides when I went over and laid on the floor near the pups she was the one more dignified and regal appearing. She turned out to be truly small and Don and Wendy were concerned about her and gave her extra attention and special dietary treats to entice her her to eat and grow. I always figured the biggest hearts came in the smallest packages and Molly has proven that to be true time and time again! There is no way my life could ever have been so complete without this energetic and loving companion in my home and in the field. A natural born hunting machine if there ever was one. When I park in an area we are going to hunt she has been known to bale out an open window to look for birds before I can get the door open. In spite of my feeble attempts at training Molly has inbred traits and abilities that cannot be taught but can only be appreciated. Thanks to Don and Wendy for being so dedicated and professional in their development programs and remaining such good friends to both Molly and I. The photos are my Molly at home and in the field. Anyone can see immediately that she is in charge at either location!